The United Nations sponsored Sustainable Development Goals (SDGs), adopted by 193 member states came into effect in January 2016. India, being one of the member states, has set up the National Institution for Transforming India (NITI) Aayog which is the nodal body responsible for facilitating and reporting on India’s progress on the SDGs. The Ministry of Statistics and Programme Implementation (MoSPI) has been entrusted with the responsibility of evolving India specific indicators for the 17 Goals. In the spirit of co-operative federalism, each of India’s 29 states is to begin planning within the SDGs framework and report to the NITI Aayog periodically. Sikkim, one of the smallest states of the country with a population density of 86 persons per square km, in response is attempting to create a guidelines based, empowering law (currently named the Sikkim Wellbeing of Generations Bill 2017) that will incentivise development planning of the state in line with the Goals. With over 82% of its total geographical area under the state Forest Department, Sikkim has had an intimate history with nature and sustainability. Sikkim became the first and only organic state of India in 2016. It was also the first state to become a Nirmal Rajya, achieving total sanitation and becoming open defecation free in 2008 – a feat many other Indian states are still striving to achieve. However, Sikkim also has one of the fastest growing economies amongst Indian states with an average net Gross State Domestic Product (GSDP) growth rate of 18.8% in 2013-2014 (base year 2004-05). As a result, planning towards a green economy has become an urgent need to ensure Sikkim retains its strong link to the environment and safe guards the health of its people and rich biodiversity. Over the past few years the state has undertaken various initiatives towards sustainable development which has focused both national and international attention on the state’s sustainability initiatives.As homage to the state’s history, the bill is being created through a consultative and participatory process involving multiple stakeholders. The team behind this mission includes Sikkim’s Member of Parliament (Lok Sabha) P. D.Rai and his office, the Integrated Mountain Initiative (IMI, a civil society organization advocating for a similar legislation in 11 mountain states of India), the Eco-tourism & Conservation Society of Sikkim (ECOSS) and a consortium of local NGOs. This initiative is being supported by the Swiss Agency for Development and Cooperation (SDC), the United Nations Development Programme (UNDP), WWF India, Development Alternatives (an advocacy based Indian NGO), independent experts as well as Cyril Amarchand Mangaldas (a leading law firm in India), supporting as the legal experts. So far the group has held over 17 consultations with stakeholders including Urban Local Bodies (ULBs), health professionals, education officers, teachers, members of the Panchayati Raj Institution (India has decentralised urban and rural governance at the local levels, with the PRIs being the rural counterpart to ULBs), teachers, youth, industries and NGOs. 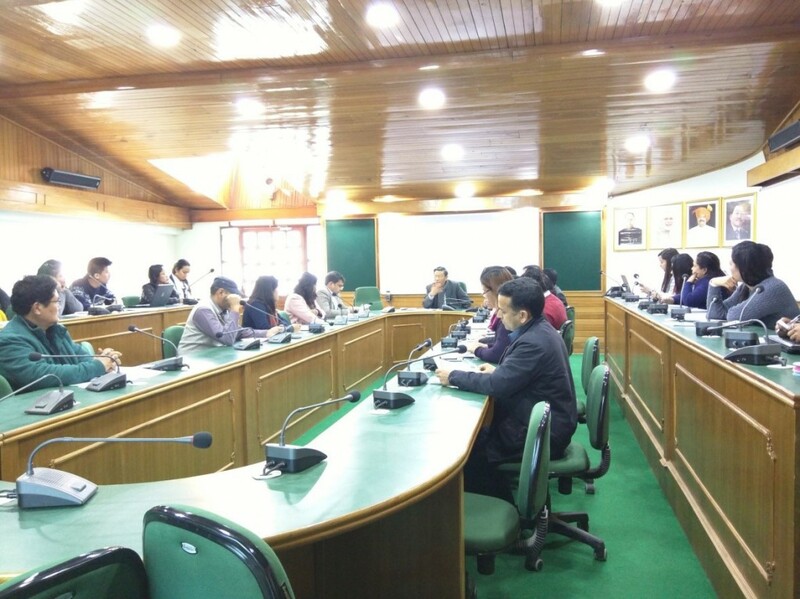 7 workshops with legislators and government functionaries have also been conducted in both Sikkim and in Delhi. The purpose has been to identify and capture challenges and possibilities in making Sikkim a greener and fairer state which would help define the larger scope of the Bill. Care has been taken to include groups whose voices run the risk of being silenced during planning processes. For instance, inputs were taken from the state’s drug user community and representatives from rehabilitation centres (Sikkim has a high rate substance use). Farmer producer organisations (working within the guidelines of the state’s Organic Mission) as well as its active civil society groups have also been involved in the planning. Industries which are increasingly entering the state due to its numerous tax subsidies and incentives have also been represented in these discussions. They are an important and often polluting stakeholder group that will be heavily impacted by the proposed law and also directly affects the state’s ecological, social and economic sustainability. This consultative process has helped identify numerous on-ground challenges related to the enforcement of existing laws and policies, as well as the gaps in monitoring and reporting. For instance the capital city of Gangtok, where although sale and use of plastic bags and Styrofoam products is banned, is burdened by a lack of environmentally responsible waste management and disposal methods as well as proliferation of plastic bags from nearby states. The proposed law, with the help of experts and civil society groups hopes to fill such gaps either through creation and implementation of new policies (especially ones that are contextualised to the needs of a mountain state) or through improving the existing policies’ implementation and monitoring. The proposed Act will be grounded within a few guiding principles such as those of shared responsibility, precaution, transparency and participation, rights of citizens, integration between economic, social and ecological needs and thresholds, inter and intra-generational equity, strengthening of local economies and valuation of social and natural capital. These principles are expected to drive the planning and functioning of various departments under the state as well as consumer/citizen behaviour. Communities and civil society organisations in Sikkim are expected to hold their government accountable for setting ecologically, socially and economically sustainable targets and their corresponding performances. This can be ensured through transparency and participation, which will mean making all plans and reports publicly available. These guidelines will further work on two levels; to inherently drive planning of each state department towards sustainable development as well as to ensure convergence within various departments to remove instances of operational conflicts (something Sikkim has been seeing increasingly with the growing number of Hydro-Electric Power Plants in the state resulting in conflicts between the Energy and Power Department – the department that oversees the HEP Plants, and the Forest, Environment and Wildlife Management Department which provides environmental clearances). The Bill is scheduled to be presented to the state’s Legislative Assembly in July, 2017. When and if the Bill is passed, Sikkim will be the first state in the country to have legislation on the SDGs and will be become one of the few states of the country, along with Assam, Madhya Pradesh and Kerala to actively incorporate the SDGs framework into their development planning. This will be followed by state-wide awareness generation campaigns for citizens, government executives and legislators to help familiarise them with the SDGs agenda and the new Act. However, the true success of this attempt will be measured by how actively the people of Sikkim check their Government’s performance on its promises and how often they measure its progress in conjunction to the principles of a holistic, green, fair and inclusive development paradigm. This article has also been published in the Green Economy Coalition April 2017 Newsletter. Click here to view the article.